Mi Patio is the recommendation of a friend of mine named Rachel, and she suggested that we hit up this little place during our between-classes break in Downtown Phoenix. 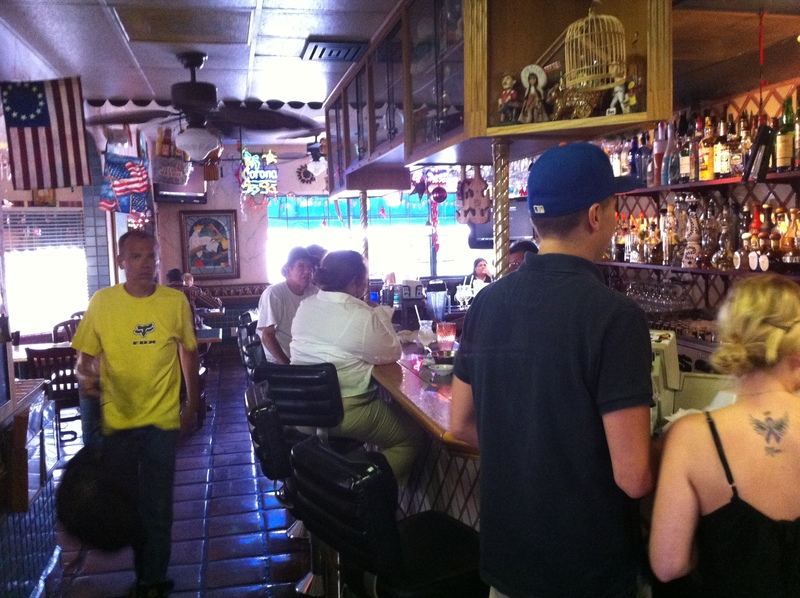 Mi Patio is located on the corner of Osborn and 7th Street, and for ASU students at the Downtown Phoenix, it’s only about a five minute drive from the Cronkite School. On the short drive over, I yelped some reviews on Mi Patio and gathered that this seemed like a pretty reputable lunch spot with a fun ambiance about it. 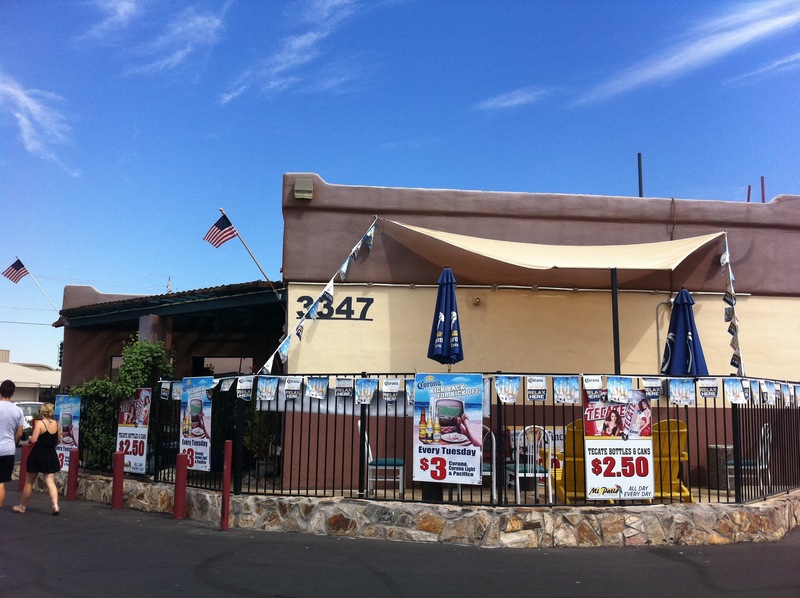 The exterior of Mi Patio in Phoenix. Photo taken by Michael West. Cruising over to Mi Patio around lunchtime, we expected it to be very crowded… and just as we anticipated, there isn’t one parking spot open. However, we lucked out and snagged this one bro’s spot as he was just getting into his truck. Thanks, bro. Much appreciated. We walk inside and the place is busy and bustling. The lunch rush is in full force at Mi Patio. What you see when you step inside of Mi Patio. Photo taken by Michael West. Thankfully we are able to get a table for six in the back room, and within minutes of sitting down, we get a fresh batch of chips and salsa delivered to us. Now it’s game time. Chippin' and dippin' at Mi Patio. Photo taken by Michael West. Every customer at Mi Patio starts is fortunate enough to be able to snack on these chips and salsa as much as they want, as the chips are free and you can get as many refills as your heart (and stomach) desire. The chips are golden and cooked to be nice and crispy and the liquidy red salsa is delicious with not too overpowering of a kick to it. But I don’t want to fill up on just the chips, so it’s time to take a look at the menu. 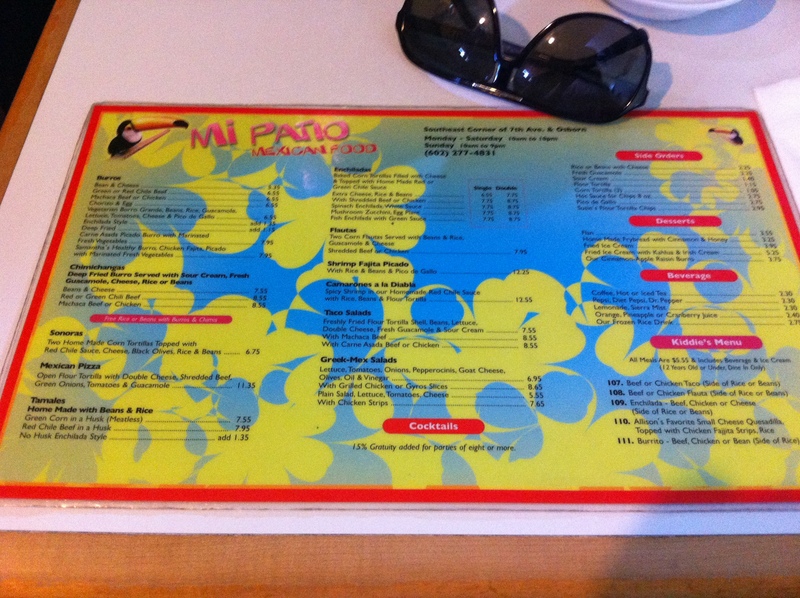 The menu at Mi Patio. Photo taken by Michael West. The menu doubles as your placemat at Mi Patio, and when I’m looking for what types of meat they have for a taco, the albondigas soup catches my eye. I grew up loving albondigas (meatballs) soup, and when I see that it is served here, there’s no way that I can turn it down. I go ahead and order the albondigas soup as well as one shredded beef taco, as our waiter tells me that Mi Patio has some pretty decent sized tacos. Despite the lunch rush being pretty heavy with most of the tables being occupied, our food was delivered relatively quickly. I’m going to start off by digging in to the albondigas soup first. The albondigas (meatball) soup at Mi Patio. Photo taken by Michael West. The first thing I notice is that there is a mountain of rice up in my sopa de albondigas. But underneath that layer of arroz lies about a handful of little meatballs and a smattering of different veggies for me to dig into. The meatballs were delicious and I thoroughly enjoyed every bite of the albondigas soup. For soup lovers, I definitely recommend grabbing the albondigas soup here. Next up, the shredded beef taco! I'm convinced that I was playing hide and seek with that taco. Photo taken by Michael West. Uh… would you like some taco with that all that lettuce and cheese? Holy moley! Somewhere underneath that handful of cheese and handful of lettuce lies some shredded beef encased in a crispy taco shell. The amount of cheese and lettuce was a little too overwhelming for me, and as you can see in the picture I had to scrape most of it off to the side. The taco was good, but I really wish they could have given me more beef and less cheese/lettuce (the amount of both was overkill if anything). I definitely enjoyed the taco, but I’ve had better tacos at some of the other locations I’ve been to. However, this is the first real restaurant-type place that I’ve been to so it’s hard to compare to the places that serve street tacos in that regard. Moving on to other orders, I felt so uncool to not order the chicken enchiladas as four other people did. 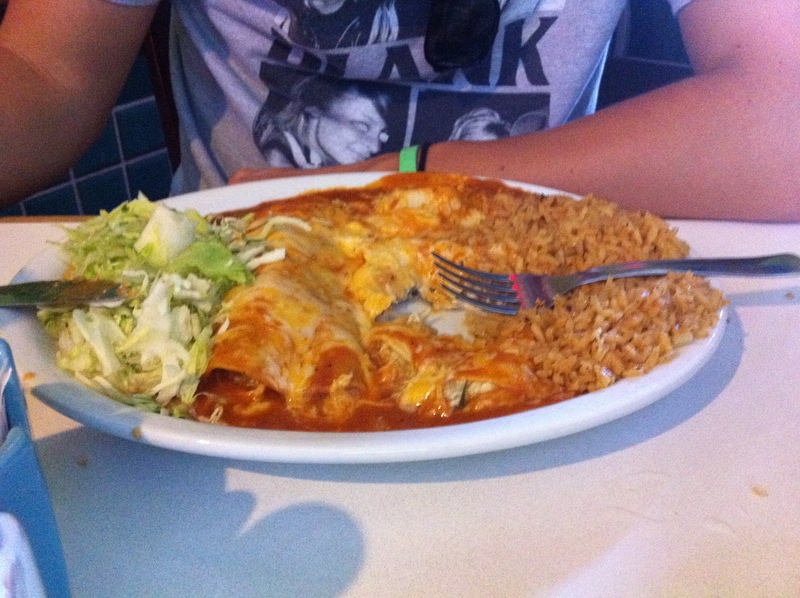 A hot and fresh order of the chicken enchiladas at Mi Patio. Photo taken by Michael West. 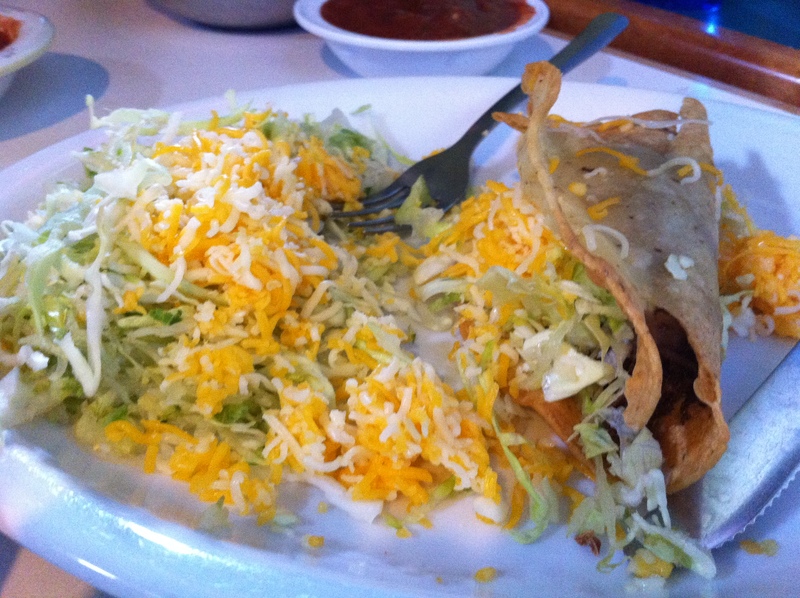 One of the enchilada orderers said that they were some, “quality enchiladas” and enjoyed his meal overall. The other three definitely concurred with the level of deliciousness that the chicken enchiladas were on. The only other different meal was the chicken and cheese quesadilla, which the consumer thought was pretty good. 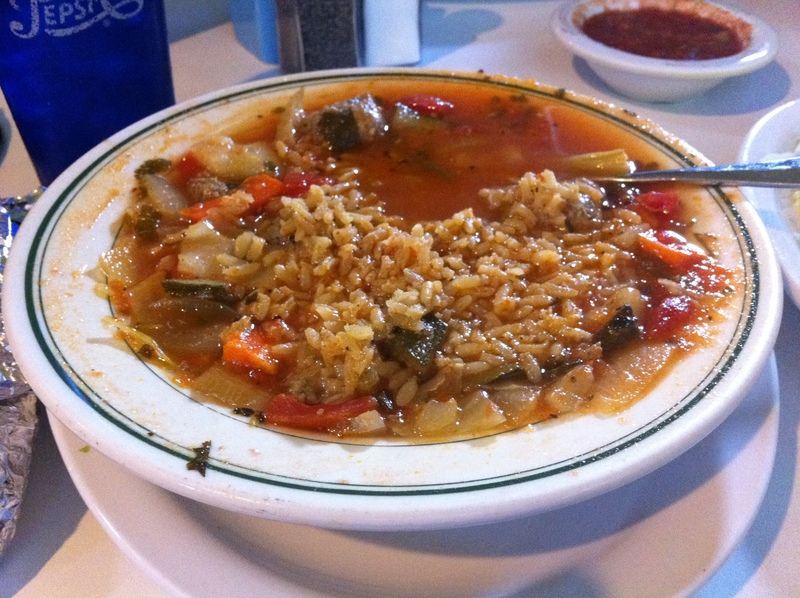 I really enjoyed eating at Mi Patio and for a taco and big bowl of soup, I checked out at $10.60. 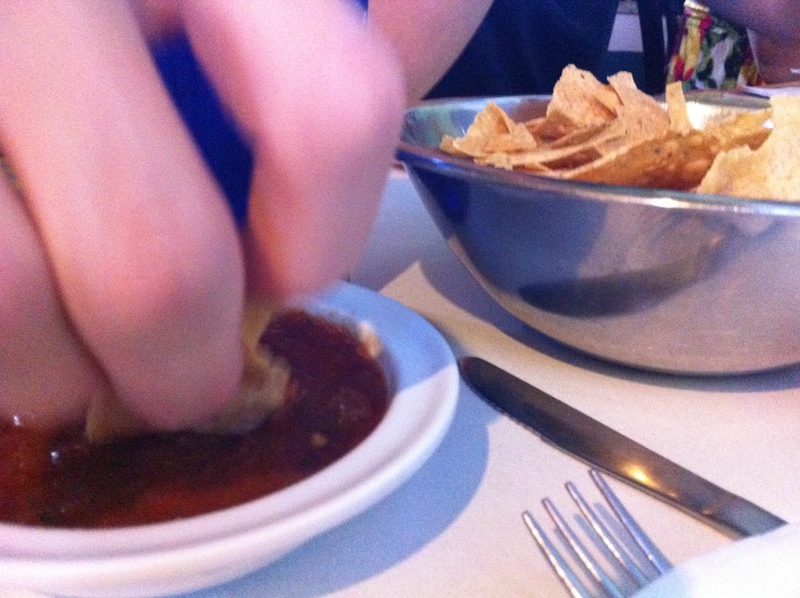 I loved the chips and salsa they had, and felt like I could have made that my entire meal… they were that good. 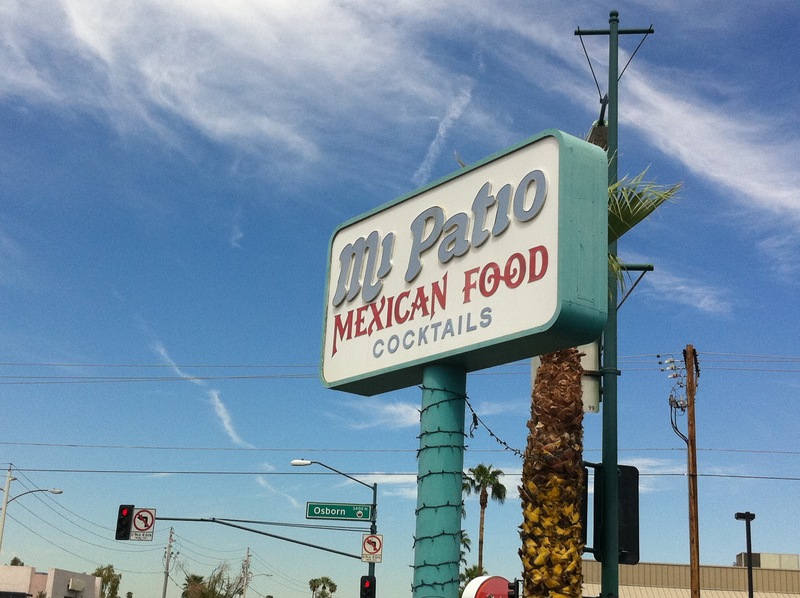 For any ASU students who have a car and have some time in between classes around lunchtime, definitely hit up Mi Patio for a good, quick meal that’ll fill you up and have you back on time for class. Overall rating: 8.5 out of 10.